We are coming to the end of an era in our generations called the “postmodern age”. This is a cultural response to the modern era which sought to solve the world’s problems through science and reasoning. During the modern era, great advancements were made in technology and medicine that will forever change the world, but the postmoderns saw that the philosophy of the physical sciences could not entirely solve problems like war, poverty, and even interpersonal relationships. So the mindset shifted in a bit of a reaction to the ideals of the modern era to what we now call the postmodern era. In this reaction, truth became questionable and relative. No longer were there any absolutes. Now, all truth is relative and dependent on each individual’s perspective which is shaped by their cultural influences. Does this frustrate you? To an extent it should. Because of the shift of postmodern thinking we now have phrases like the one commonly being used by new sources all over: alternative facts. 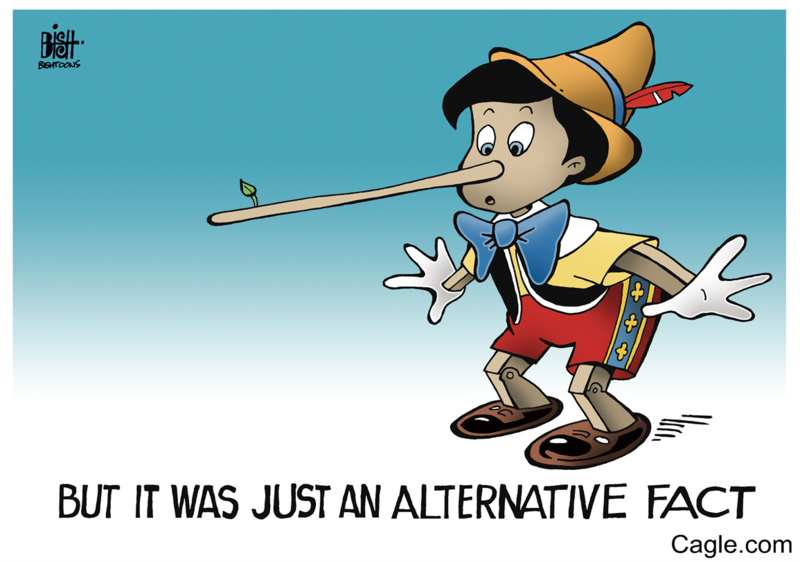 Instead of calling something a half-truth or a whole lie, because of political correctness we now refer to misleading someone by using only the convenient facts as using “alternative facts”. Your truth is valid, and so is mine, and don’t you dare judge my truth with yours. This is maddening in the political realm. It is exhausting in the spectrum of news sources available today. It is exactly what we teach our children not to do. Maybe you were taught as I was: a half-truth is a whole lie. Contrary to current thinking, there is truth that is not relative. Jesus is truth. The gospel is truth. The consequences of sin is truth. The love of God is truth. Even in society there still exists truth that is not relative. One needs merely to look for it. In order to find truth in any circumstance, you must consider all sides of a situation – you must consider the context. What we don’t want to admit is that the church has been functioning with partial truths for nearly the entirety of its existence. Even the concept of denominationalism is founded on the idea that you can read the bible through one lense and me another, and we can come to differing conclusions on the same topic. When I focus on one set of scriptures concerning a topic, and you focus on another set concerning the same topic, we may disagree. Our goal, then, as followers of Jesus, should not be to read the bible with a preconceived lense, rather we should read the entirety of scripture in context in order to derive our conclusions from the text instead of inserting them into it. When we insert our ideas and refuse to look at passages that don’t jive with our desired conclusion, we invite division and discord into the church. I pray that the church doesn’t imitate our current culture in claiming “alternative facts”. I pray we are humble enough to accept correction where we have been ignorant. I pray that the church can lead the way in standing for truth as it is written in the Word of God. I pray that our desire for contextual understanding brings grace and unity rather an excuse to further divide. What’s the upcoming generation going to be called? I don’t know – maybe the post-postmodern era. In any case, I pray it is a returning to truth that is NOT relative while maintaining spiritual fervor. Imagine our country decided to wage war on Christianity. If you were a Christian you would be condemned to death. Which kind of Christian would they choose to persecute? Would it matter whether you were Methodist or Baptist or church of Christ? What would matter is your allegiance to Jesus. Church of Christ, Christian Church, Disciples of Christ, Baptist, Methodist, Presbyterian, Nazarene, Assembly of God, Church of God, Pentecostal, Lutheran, Anglican, Seventh Day Adventist, etc. These are just a sampling of the myriad of denominations we find in our culture today. Millions of Christians meeting in different buildings under different monikers all claiming to love Jesus and each other but not willing to fellowship each other creates confusion for those outside the church. If I wasn’t a Christian, if I didn’t go to church, I would be appalled by what I saw in churches. I would see that they claim to have a better way through Jesus and are supposed to love one another, but they can’t even get along with one another so there is a different church on every corner. If I wanted to come to know Jesus and join a church, how would I know which one is best or right? This kind of division flies in the face of Jesus’ prayer for unity in John 17. Why did he want the church to be unified? Because of the spread of the gospel. So that people would know God sent Jesus. The letters to the Corinthian church were written to convict them of their division. Now churches divide all the time even within their specific tribe, and people don’t even bat an eye. How will we ever be the true church that belongs to Jesus if the selfishness and bickering within us gets in the way? Are you sure? Have you studied for yourself, or have you just been in a movement that has taught a certain way for generations. With the onset of more and more independent and non-denominational churches, can we honestly say we know their theology well enough to sit in God’s seat of judgment in condemnation of them? Should we ever sit in that seat? Even as you read the New Testament epistles, you see a wide variety of religious understandings and practices. Jews wanted to force Gentiles to conform to their traditions. Gentiles wanted nothing of it. This was a huge schism within the church, but over and over we read of a desire for peace and unity in diversity based on the foundation of the gospel event. It is time for churches everywhere to not only want to accept the grace of Jesus but be willing to extend that grace to others as well. It is time to remember that God’s grace covers my sins and my doctrinal misunderstandings insofar as I desire the ways of Jesus and strive to follow them as best as I understand. If that grace covers me, then it covers you too. We look at the lists of sins and consider all the personal sins with abhorrence, but we seem to forget that the sins most written and spoken about in the NT were the sins that divided the church. It’s time we started to get to know and love those in the other church communities that find their direction from the Bible and look to the death and resurrection of Jesus for salvation. It’s time we presented a united front in our communities as we publicly express our unity with one another. It’s time we repented of our arrogance and division. It’s time we begin to recognize the one church that Jesus died for – not a building with a sign on the door, but all people who have surrendered to Jesus.